Klee and Picasso are esteemed as outstanding antipodes of the history of 20th century art, though as artistic personalities they could hardly be more different. One was Mediterranean and worldly, the other romantic and spiritual: Klee's poetic expression and his leaning towards satire and irony stand in contrast to Picasso's drama, his sensuality and his pathos. Despite all their differences in temperament, Klee and Picasso still belonged to the same generation and worked on the renewal of art from the sources of human creative energy. In the diversity and inventiveness of their pictorial language, they were similar to one another. Picasso was a natural phenomenon, drawing all his contemporaries under his spell and provoking them into either approval or opposition. Klee was also deeply impressed by Picasso — but being a great individualist he did not simply succumb to his influence, but set out with the aim of understanding the "Spaniard". His artistic utterance displayed a mixture of admiration and critical irony, of acceptance and contradiction. Klee and Picasso most probably met each other personally on two occasions during their life time: in 1933 in Picasso's studio in Paris, and in 1937 at Paul Klee's house in Berne. Apart from this, both artists were keenly interested in each other's activity. And now — over 70 years later — the two great masters meet again in a unique exhibition at the Zentrum Paul Klee which illustrates in detail the complex relationship of the artists to one another. The dialogues between Klee and Picasso are at the focus of the exhibition, showing Picasso as a precocious child prodigy and Klee as a critical outsider; works from Picasso's Blue and Rose periods are opposed to Klee's satirical glass paintings. It shows major works by Picasso from the cubist period and Klee's response to Cubism — this great revolution in the history of art in the 20th century. Klee's painting "Homage to Picasso" from 1914 is his only tribute ever accorded to another artist. Through Cubism Klee came to know Picasso's works in the original for the first time. The consequences for his work are obvious and can be observed over a longer period. Klee, however, developed a discerning approach to Picasso, and carefully distinguished between positive and negative elements. 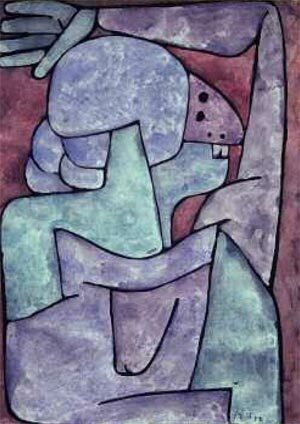 For Klee "analytical" Cubism in particular represented an important impulse. He derived a basic compositional design from it, in which he could integrate motifs of different kinds. 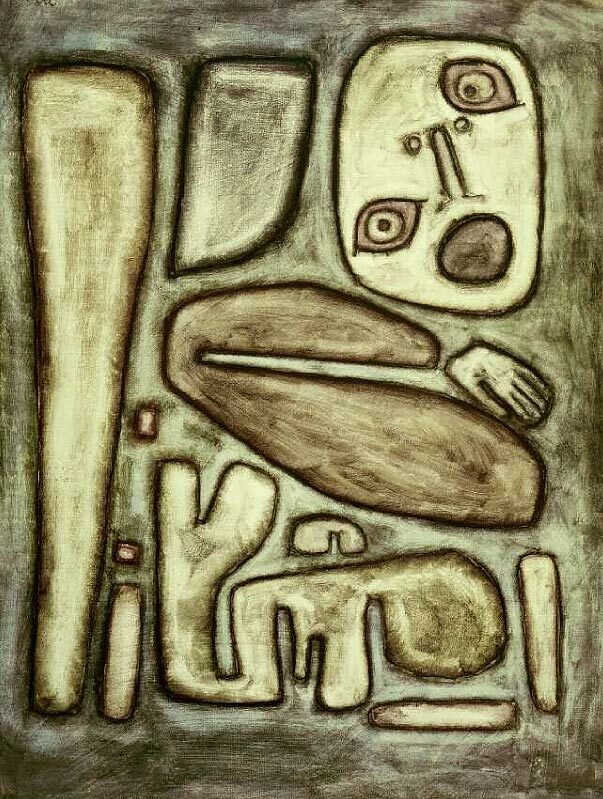 Klee adopted cubist forms particularly for the depiction of landscapes, but did not respond to cubist representations of the human body except when making a joke. The innovative achievements of this way of painting, its dissolving of the classical fig-urativeness and the creation of new pictorial vocabulary, appeared in Klee's eyes to lead to the destruction of the living organism and to artistic randomness. With landscapes, however, he saw cubist structure to a certain degree appearing in nature. The further development of Cubism is evident in his landscape pictures, in his Tunisian watercolours or in "Quarry" (1915), a watercolour in which he recognised the cubist structures in the excavated walls of the stone quarry at Ostermundigen near Berne. One particular pictorial form of Cubism was the oval painting. Distinct from rectangular canvases, the oval pictures with their artificial shape acquired the character of autonomous pictorial objects — an idea which Picasso and also Braque particularly liked. 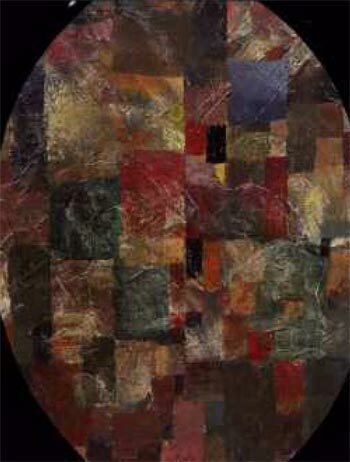 Klee too was pleased with the oval picture shape and gave many of his paintings this typically cubist format. 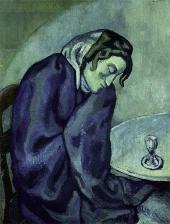 In particular he used this for "Homage to Picasso" (1914), the painting with which he paid his respects to his artist colleague. Unlike Picasso, Klee developed the special shape of his oval pictures not from the depiction, but adopted it in the form of a quotation. While Picasso intensified the cubes and the surfaces in the middle of the picture, relaxing them toward the edge, Klee maintained his surface pattern on all sides and intersected the inner rectangular shapes with curved borders. 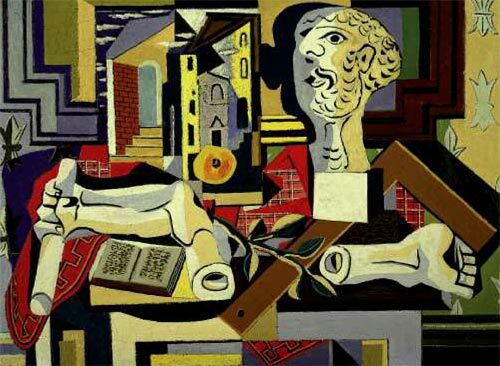 In 1912 the cubist system of painting changed when Picasso and Braque began to introduce items from reality into their paintings — newspaper cuttings, strips of wallpaper, wooden imitations or stencilled word fragments. "Papier colli" was the name given to the new technique, which was a precursor of the Dadaistic collages and extended the palette of artistic expressive possibilities by means of the effect of the material. Painted, drawn and glued elements complement each other and create complex combinations between depicted and actual reality. Klee must have come only in fleeting contact with synthetic Cubism, as the new direction was called, since during the years of World War I the flow of information between Germany and France was broken off. Nevertheless in his works from the 1910s, it is possible to recognise artistic methods which are similar to synthetic Cubism, but which clearly bear Klee's mark. During this period Klee developed his own entirely personal form of "papier colli" — he cut up his own works and reassembled them as new, in doing so introducing no foreign materials but falling back on his own reserves. In contrast to Picasso he did not open himself to the reality of everyday life, but remained within the closed circle of his own universe. 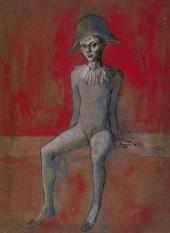 At the beginning of the 1920s Klee and Picasso were far apart from one another. Around 1917 Picasso had completed a stylistic change to "classical" forms, which many of his contemporaries judged a retour a I'ordre, a conservative return to figuration and objectivity. 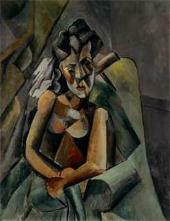 They saw in the artist a revolutionary survivor who had exhausted himself through Cubism. 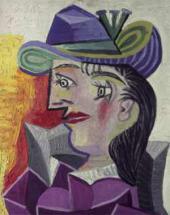 Only a few observers were open to the dialectic change hidden behind this transition, and interest in Picasso the person and his art dwindled. 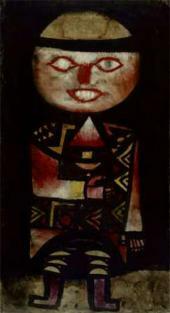 Klee must have known of Picasso's new direction since the late autumn of 1920 when he was in Berne, where the "Exhibition of French Painting" at the Art Gallery showed an important example of Picasso's new direction, the picture "Arlequin au loup" (Harlequin with Mask), from 1918 (today it is in the Art Museum in Basel). No reaction from Klee was registered, but judging from his own development, it can be presumed that the "new Picasso" also became less interesting for him. 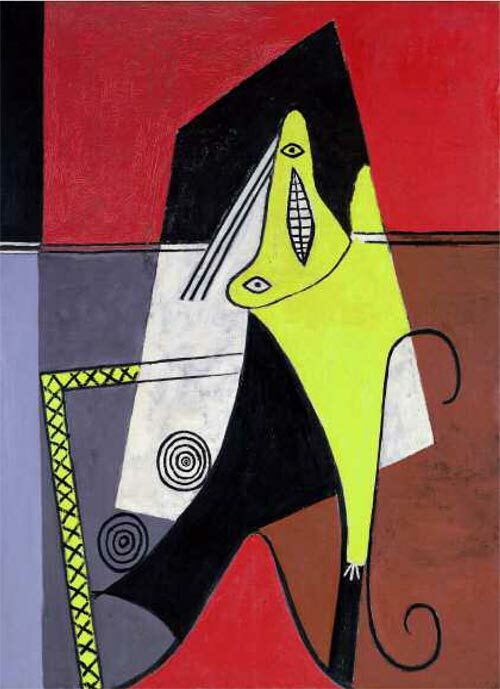 In the face of the increasing stylistic diversity of his own works, and his continuously far-flung fantasies seeking with irony and wit an individual form for each theme, Picasso's reduced vocabulary, orientated towards the antique and classical, seem to be diametrically opposed. Faced with his own growing fame, the declining appreciation for Picasso and his apparently decreasing creative energy might have calmed Klee somewhat. 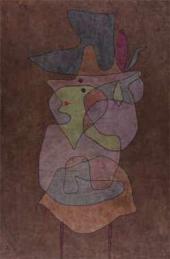 Another factor, which must have strengthened Klee's self-confidence vis-a-vis Picasso, was his own success in Paris, where in 1925 he had several exhibitions. The Surrealists recognised Klee as the forerunner of their own ideas — an honour which he shared with Picasso. Other fractions of the Paris art world would celebrate him as a German Romantic and visionary poet of spiritual depths. This unexpected regard led not only to Klee being appreciated as the only German artist in Germany who had succeeded in arousing interest in Paris, but also must have given him the assurance that he was able to compete in the Paris art world with his own pictorial language. Klee, however, accepted the honour calmly. Neither in 1925 nor in 1929, when there were comprehensive exhibitions of his art in the representative Paris gallery Bernheim Jeune, did he bother to travel to the French capital and deepen new contacts through personal acquaintance. He had become a self-confident artist who felt at ease with his incomparable individuality, and with being called the "Weimarer Hexenzahn" (Weimar Witch's Tooth) by the poet Louis Aragon. A focal point of the exhibition are Picasso's works of his surrealist phase in the 1920s and 1930s. 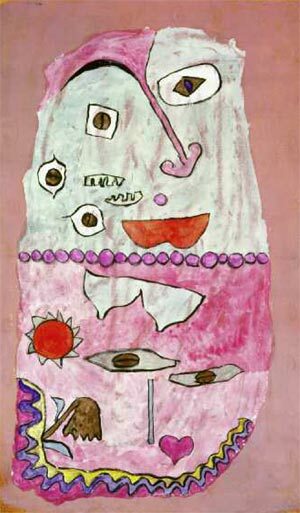 The deformed bodies and distorted faces of this period coincided with Klee's grotesque fantasies, and led to a pictorial conversation which profoundly influenced his late works in the 1930s. 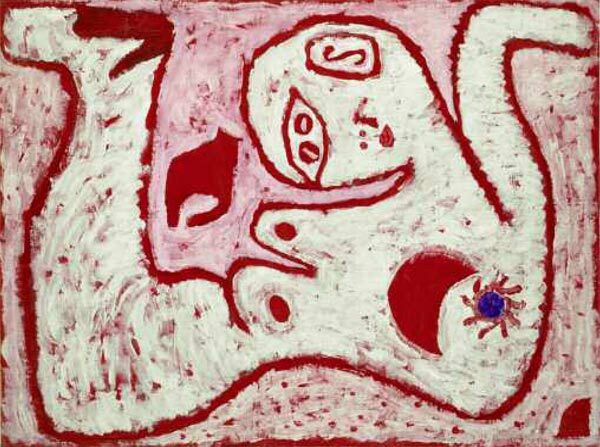 Picasso's large scale paintings, and in particular his "Large Women", induced Klee to abandon his small scale format and create large canvases. And Picasso's drastic depictions of emotions were also taken up by Klee and from these he developed his own expressive moods. Despite all the stimulation which Klee derived from Picasso, he nevertheless always maintained the independence which makes his work unmistakable. 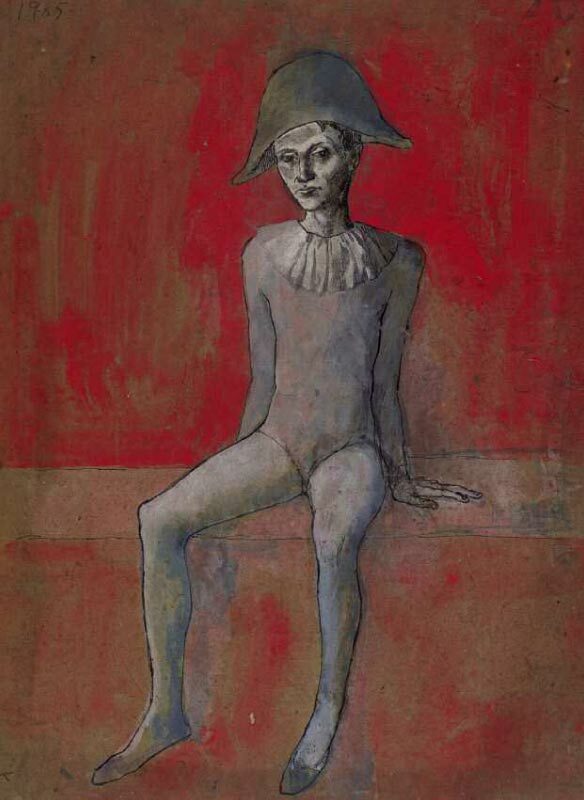 As a great individualist, Klee formulated Picasso's ideas for himself, and from Picasso's drama and sensuality made compositions full of sensibility and poetry. In addition, Klee's pictorial commentaries were seldom without a deeper meaning or irony; Picasso's pathos particularly provoked him to parodistic commentaries. A telling example of Klee's ironic attitude regarding Picasso can be found in a group of works which represent parodies of Picasso's Minotaure and of his bulls, which occupied the Picasso's attention as much as no other mythological figures. From 1933 onwards the Minotaure appears as the artist's double and representative, as the embodiment of vitality and passion, but also as a victim and bearer of moral guilt. The photographer Brassa'i wrote: "For the painter of Guernica the ancient mythological animal, half human, half bull, stood close to the 'toro' of the Spanish bull-fights, who is endowed with secret, volcanic strengths. 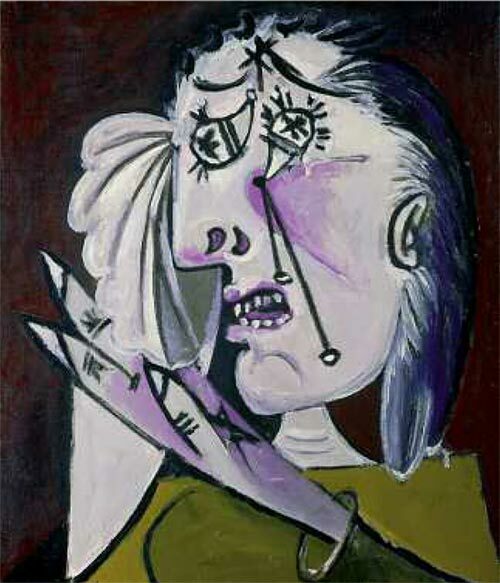 Picasso had sensed these dark forces within himself and humanised them. His Minotaur personified the sardonic 'monster' with steaming nostrils enlarged with excitement, certainly dangerous but quick witted, which circled round sleeping girls and then plunged upon their challenging defenceless bodies." 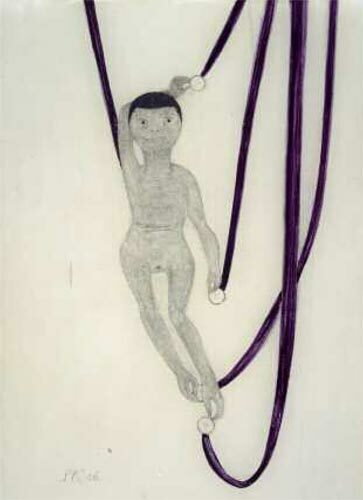 In several series of works an entire catalogue of "Urchses" developed. There are the "Urchs, Undecided", the "Irritated Urchs", and "Old Urchs", then the "Urchs by the Water", the "Urchs, Wandering Downhill" and the "Urchs Fleeing". 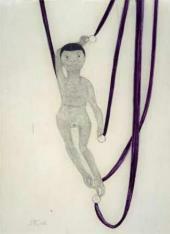 At least 12 pencil and brush drawings from the year 1939, and three more from the year 1940 play upon this motif. 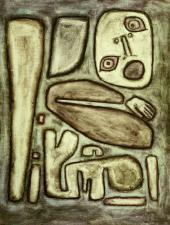 Unusual among them is the "Urchs from the Heroic Age", with which Klee quotes a mythological relative to the Minotaur. In looking at the "Urchses", it is hardly necessary to remark just how fundamentally they differ from Picasso's Minotaurs and his bulls. Their aggression and violent pathos stand in opposition to an almost idiotic peacefulness. Between 1937 and 1940, Paul Klee painted heads and faces in unusually large numbers. Presumably some of them are portraits of acquaintances and contemporaries, while others are anonymous depictions. A "portrait gallery" of this nature is unique in Klee's legacy: all his life the artist was extremely interested in the appearance of his human companions and had thought up an appropriate pictorial form for several personalities. Previously he had never dedicated entire series of sketches to human physiognomy. The question of the reasons and inspiration for this new kind of work group leads again to Picasso — in many of Klee's heads, typical qualities of Picasso's individual stylistic characteristics, his deformations and displacements, can be observed. 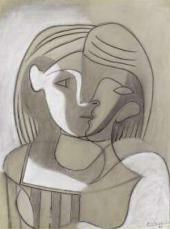 With Picasso, too, the focus on human physiognomy grew during the second half of the 1930s. Long series of female busts and half-figures were created, which in many cases are portraits of his two, highly differing lovers, Marie-Therese Walter and Dora Maar. With continually new approaches, Picasso varied his pictorial language achieving characterisations not through mimicry, but by choice of colour and playing with forms. He painted the same head, once coloured and in almost geometric segments, another time in pastel colours and soft, artistic forms. Clothing and head-covering were also used for new variations as much as gesture and posture. Klee adopted many of these impulses while in no way following Picasso in his formal radicalism, and also took some of his inventions of form as the reason for subdued satire. Many of his new portraits he painted with paste paint or oils on paper, a technique which led to an unusual bold colourfulness, entirely different from the delicately shaded watercolours of his earlier years. As in previous years, Klee quoted from Picasso's asymmetries and his distorted eyes. But as in those days, he could only accept the displaced mimic as the expression of an exceptional psychic state and internal disturbances, since form for him was always directly linked to the content and psychological expression of the character. While Klee came with these heads very close to Picasso, the fundamental differences remain. In conclusion, the exhibition unveils a confrontation of two artistic universes and a cultural highlight of international significance, and demonstrates how both artists, in quite different ways, wrote a new chapter of art history in the 20th century.